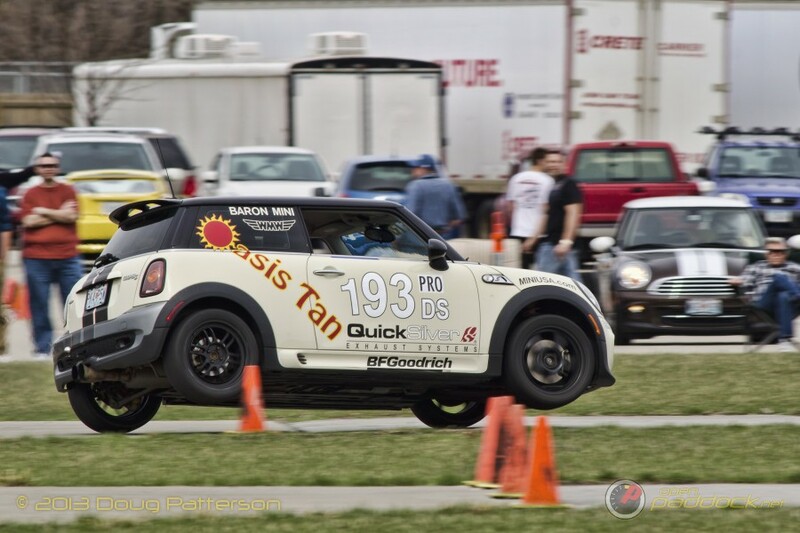 TOPEKA, Kan. (March 20, 2014) – Beginning with this past weekend’s Tire Rack® SCCA Dixie Championship Tour, top finishers in the Tire Rack SCCA Solo program can take home contingency cash and prizes from a host of companies. Prizes are available for class winners at Championship and Match Tour events and for class and challenge winners at Tire Rack ProSolo® events. 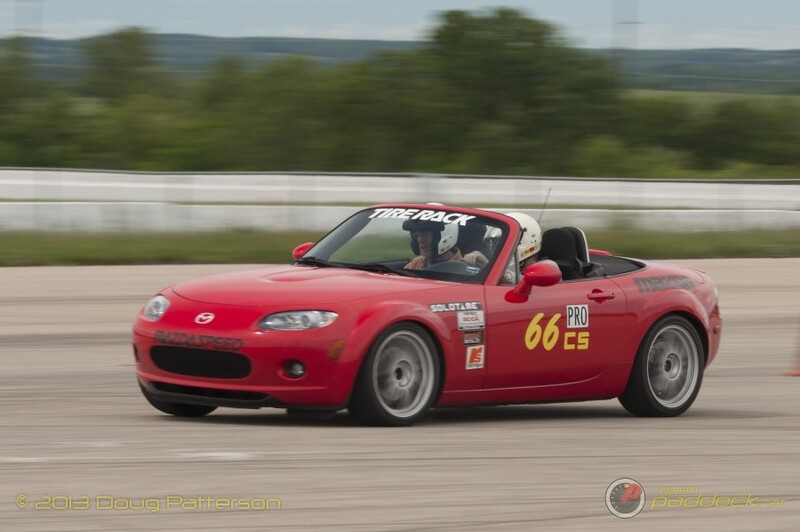 Rodney Giebel of the Kansas City Region SCCA hustling his Mazda Miata around the Solo Pad at Heartland Park Topeka. Mazda, the Official Car of SCCA, will offer $300 payouts for event class winners in all three formats of competition. Second-place class finishers will be eligible to earn $175. ProSolo Super, Ladies and Bonus Challenge winners will earn $400 for a win and $250 for second-place finish. Year-end ProSolo points leaders, in-class, will get a $1,000 bonus, with second getting $600 and third receiving $300. The payout schedule for any challenge year-end points will be $600, $400 and $200 to the top three, respectively. MINI USA will be offering cash prizes to eligible participants in the three formats of competition. Class winners can claim a $250 prize, while second and third can get $100 and $50, respectively. The ProSolo year-end points winner in each class can also get a $1,000 payday. Honda Performance Development, Toyota/TRD, Scion Racing and Subaru of America will offer awards to ProSolo competitors driving their cars. A win in a Toyota or Scion will equal $200. A year-end Class or Challenge Championship will be worth $1,000. Additionally, Scion FR-S drivers finishing second in class will be eligible to receive $100. Honda will reward class podium finishers with $100, $50 and $25 prizes, respectively. A $200 reward is also up for grabs for a Honda driver who wins the year-end class or challenge title. Subaru will award class winners $150, with second getting $100 and third eligible for $50. Like the auto manufacturers, tire makers are throwing their support behind all three Tire Rack SCCA National Solo programs. Craig Wilcox demonstrates the crazy amount of grip in his BF Goodrich Rivals at the Kansas City Region’s first Solo Event of 2013 at MCC. BFGoodrich Tires, the Official Street Tire of SCCA, will be offering prizes in the form of tires. First place finishers in ProSolo Super and Ladies Challenges, as well as class winners in any of the three divisions, will be eligible to redeem two tires. Second place finishers in each of those categories can claim one tire. In addition, ProSolo year-end point leaders in class can be awarded four tires, with second getting two tires. The top finishers in year-end ProSolo challenge points will also be awarded four tires, provided they meet the program’s requirements. Hoosier Racing Tire’s program is identical to that of BFGoodrich Tires for National Tour and ProSolo class event wins. Upping the ante for the ProSolo Finale, Hoosier Racing Tire will give class and challenge winners four tires, with two going to second place. In addition, four tires will be doled out to the ProSolo year-end Class Champion and Super Challenge Champion who meet the program’s requirements. Kumho Tires will award ProSolo class and challenge winners, in addition to class and Match Tour Shootout winners, $300 in product credit. Second place will get a $200 credit, with third eligible to get a $150 credit. In addition, Kumho Tires will be awarding four tires for a ProSolo year-end class or challenge points title. Street and Street Touring class winners will get a bump in the form of a $600 product credit from Kumho Tires, regardless of event format, with second-place getting a $400 credit and third-place receiving $300. Hankook Tires will also be providing contingency payouts in 2014, but has not released the details of the program. Those prizes will be announced at a later date. Hawk Performance, the Official Brake Products of SCCA, will award certificates to the top three eligible finishers in each class at Championship and Match Tour events. Winners will get $100 certificates, with second and third getting certificates worth $50 and $25, respectively. Each contingency opportunity requires pre-registration. Details and instructions to register for each of these programs are available at http://www.scca.com/solo/content.cfm?cid=44518. With The Tire Rack Dixie Championship Tour in the books, the next event on the National Solo calendar is Round One of The Tire Rack SCCA ProSolo Championship, March 22-23, at Arkansas Aeroplex, in Blytheville, Ark. More information on Tire Rack SCCA Solo can be found at www.scca.com/solo. Like us on Facebook and follow us on Twitter @SCCAOfficial. Tagged 2014, Contingencies, solo. Bookmark the permalink.